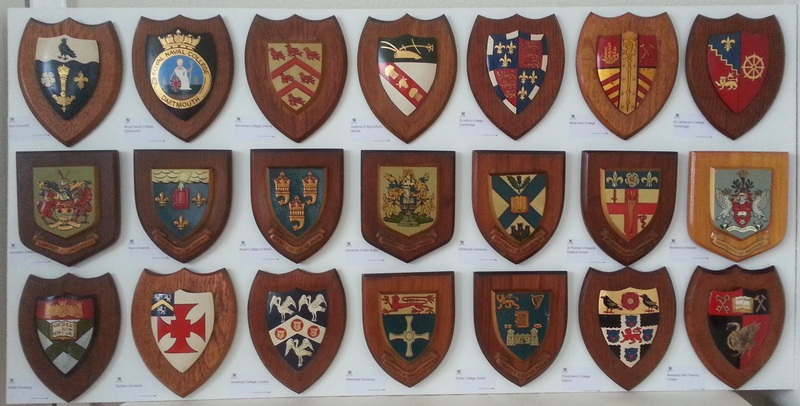 A few years ago, we discovered that many of the university shields - which used to hang in the assembly hall at BHCHS - had laid unnoticed in an office. We displayed them at the exhibition celebrating the 75th anniversary of the school in 2013. The collection is not complete, but it was interesting to identify them. Some of the institutions are colleges that have long since suffered the same fate as our school. Click HERE to see the full list of shields in the collection. We are now giving former pupils a chance to reclaim shields they originally donated, or to put in a bid for one of the shields. We will return any shields to their original donor subject to payment of postage & packing (£3.50 UK). If the shield was jointly donated, this would also be subject to their agreement (assuming it is practicable to check). Anyone else may submit a bid for one of shields. This will be via a closed auction. Bids to be sent to Graham Frankel by 30th June 2017. After the closing date you will be notified if you were successful and the shield will be sent to you on receipt of the payment plus postage & packing (£3.50 UK). All proceeds from the sale of these shields will be donated to the St Clare Hospice.